A couple more completed freight cars have been discovered among the boxes of hobby kits and supplies. 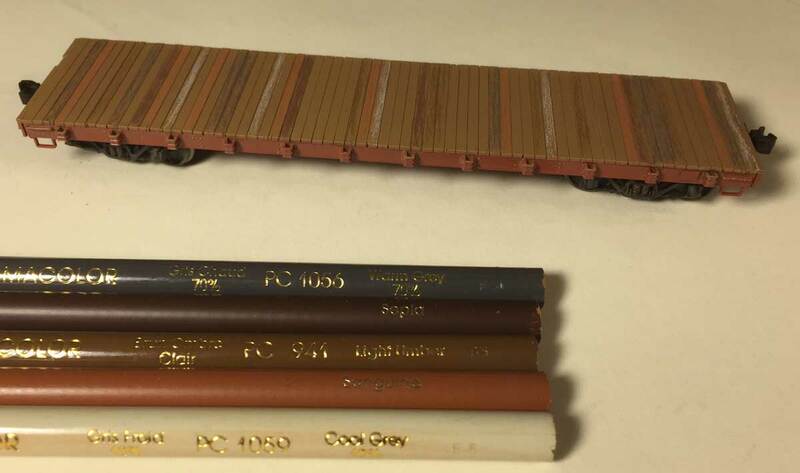 Each of these two flat car kits were built several years ago and even painted. The black car with fish belly side sills is a Funaro & Camerlengo kit for a Baltimore & Ohio P-11 class flat car. The other car is a Tichy Train Group kit that I may have built 20 years ago. The model is pretty close to representing several prototypes that fit my 1926 era. I have a few flat cars in service but none are proper for my era so these two newly found models were given the fast track to completion. The Tichy flat car is a very good introduction to model building with lots of details. Richard Hendrickson published an article in the June 1993 Railmodel Journal that covers several prototypes. As the model was already painted a Mineral Red color, my choices were narrowed. One particular series of cars caught my eye because of the specific trucks that were used on the cars. I decided to letter the flat car to reflect this prototype series. I did not have decals on hand but a set was found on the Internet and they arrived quickly. 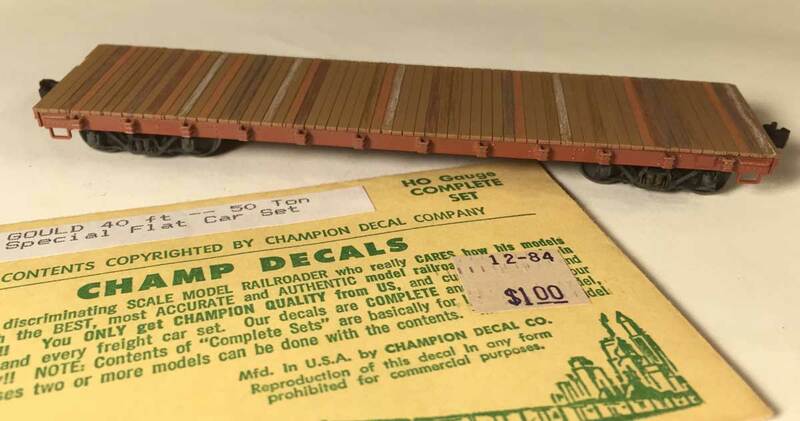 The Champ decal company made a specific decal set for these models. HC-646 contains enough data for two models with several railroad names. Champ went out of business years ago but unused sets are floating around out there. Before the model was decaled, the deck was painted to resemble wood. The prototype was built earlier in 1926, so it would be a newer looking deck for my November 1926 era. After the paint was dry, I used a number of Prismacolor pencils to vary the color of assorted deck planks. Here are the colors that I had on hand; Warm Grey 70%, Sepia, Light Umber, Sanguine, and Cool Grey 10%. The car looked funny after this step but I knew a couple of weathering washes would tone down the effect. This process was completed before the decals arrived. Here’s a good look at the deck. After the decals were applied, a gloss coat of Future was brushed over the side sill and decals to seal the work. Once that was dry, the model was sprayed with Model Master Clear Flat Lacquer from a rattle can to seal the color pencil work and dull the gloss coat on the decals. I let this dry for a day before hitting the car with the first weathering wash. I mixed a few acrylic colors to get a dirty grey. Some Raw Umber, a little neutral Grey, and a small bit of Titanium White were mixed together on a plastic yogurt container lid for a palette. A damp wide brush was dipped into the mix, then into some water before it was spread onto the flat car deck. This step is over before you know it but I recommend practicing on some test models if you haven’t worked with weathering washes. Once this was dry, the model received another coat of clear flat from the rattle can. The work needs to be sealed if you plan to do another wash with a slightly different shade. The model dried overnight and a thin wash of oil-based Burnt Umber was applied to highlight the details. I concentrate on the deck but excess flowed onto the side sill and around the stake pockets. This is another quick step in the process and the model was set aside to dry overnight. PanPastels were used to add the next layers of weathering. Raw Umber was dabbed onto the deck and rubbed into place with a smaller foam piece. It was also lightly applied to the side sill and trucks to add a dusty appearance. Neutral Grey Extra Dark was applied sparingly for soot on the car deck. A Q-Tip was used to blot some material onto the car and the clean end of the Q-Tip was used to burnish the color into place. Hi-Tech Details rubber air hoses had been installed and they needed a little color for the metal parts. Tamiya Sky Grey was on hand and a fine brush was used to apply the color. A bit was also dry brushed onto the tack board on the side sill to mimic some paint failure on that wood part. Very small squares of paper were cut and glued into place on the tack boards to represent route cards. As a final step, my trusty Prismacolor Cool Grey pencil was used to highlight the side sill edges and other details. A couple of chalk marks were also scribbled with the pencil. At the start of this post, I mentioned a B&O flat car. Those prototypes were built in 1902, 20 years before the NC&StL cars. The deck is probably a bit too dark, so I may apply light grey PanPastel to lighten it up. These steps seem like a lot of work but each step is simple and done pretty quickly. I recommend letting the model dry thoroughly after applying the gloss over the decals, each flat coat, and each weathering wash. There’s always more to do on the model railroad, so I’m certain you can use the time between steps wisely. It’s a great feeling when a couple of new freight cars enter the fleet. These two models represent a new milestone for me as they will replace a pair of freight cars that do not fit my 1926 era. I now have additional incentive to move other freight car projects along because each new addition will push the fleet along to follow the prototype. Thanks for stopping by. Feel free to share a comment in the section below. Please follow the instructions so your comment can be posted. All comments are reviewed and approved before they appear. Nice cars. Curious as to whether or not you gloss coated the cars before the decals. Seems to be the standard approach but I have heard some say that this is not required. Loosely described, applying decals over flat, matte, paint is a lot like applying Scotch tape to sandpaper. The paint’s irregular surface is what breaks up the shine; and the decal film would be lying on the mountaintops and hanging above the valleys; that is largely what causes decal film silvering. Applying decals to gloss paint would be more like sticking that same Scotch tape to glass instead of sandpaper. Great work woth a fine result! Congratulation! Colored pencils, going to have to try this! Have quite a bundle of Prismacolor which have been sitting around for several years looking for something to do now that I don’t draw much any more.